Behind most classic films there is an unforgettable score, and in most cases many of these films contain music that's even more iconic than the films themselves. A score is written specifically to accompany a film, by the original film’s composer(s). And ever since the beginning of contemporary film making music has been used to accentuate the most famous movie scenes. I have compiled a list of the most famous films scores of all time. These are melodies that everyone will recognize. 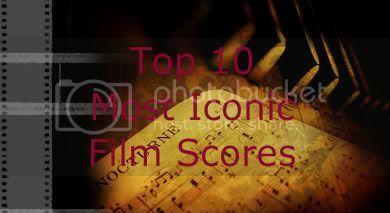 Without further ado I give you my Top 10 Most Iconic Film Scores. Enjoy! Gone With the Wind is one of the most famous scores in film history. It is the highest and most immediate representation of music of Hollywood's pre-World War II Golden Age. Composer Max Steiner's beautiful melody will definitely sweep you away. Take a college professor, give him a whip and a hat and you've got a movie icon. Set the entire thing to a sweeping, rolling, upbeat theme and you've got a legend. This theme, composed by John Williams, was so iconic throughout the Indiana Jones series and holds up just as well today if not better. A brilliant theme for a brilliant film. Bernard Herrmann collaborated with Hitchcock on a number of his movies, but few have matched the quality of his work here. He created a score that Hitchcock admitted provided thirty-three percent of the film's effect, and happens to be one of the greatest horror scores of all time. Monty Norman composed his signature work with the main theme to James Bond. This widely known iconic film score introduces us to one of the most iconic spies of all time. The theme uses a surf rock style guitar riff. At the time of the first film's release, surf rock was all the craze. The first time I heard this music, as a little girl, it was to the Tyson chicken commercial. Little did I know it was actually the theme music to a classic western. Elmer Bernstein's Academy Award nominated score includes one of the most recognizable pieces in film music history, the up-beat, rousing Magnificent Seven theme is a stellar example of a classic Hollywood score. Composed by John Williams, Superman's theme is arguably one of the most instantly recognizable and iconic pieces of music of all time. The music is extremely patriotic in sound and energy. It had to fly just like the main character and Williams delivered on every level. On the film's soundtrack this piece is called "Titles" because of its use in the movie's opening titles sequence, but it widely became known as "Chariots of Fire". Written and recorded by Veangelis, his amazingly iconic film score has since been recorded and covered by numerous performers, and to this day is used in various television programs and sporting events. Director Stanley Kubrick does something incredible with the first two and a half minutes of his masterpiece, 2001: A Space Odyssey. He gives us a black screen – no text, no images – accompanied by the dynamically growing sound composed by Richard Strauss. This music is definitely iconic for sure. Simplicity was the key to John Williams two note theme that increases in intensity to mirror the approaching shark's heartbeat as it prepares for attack. The theme is a stroke of genius. It's just as haunting as it is unforgettable. Duh, I know it's an obvious choice, but when it comes to the most iconic film scores this masterpiece takes the cake. Though the entire series has a great soundtrack (“Imperial March” and “Duel of the Fates”), Episode IV: A New Hope is where it all started. Aside from the aforementioned main theme, the film carries within it a musical motif that John Williams manages to spin to fit just about any mood. Brilliant! Now that you’ve read and heard my picks for most iconic film scores, what film scores to you find iconic and why? I thought you'd have Lion King on this for sure!! Aw, well! Good list!